5 Little Known-Facts Every Hydroquinone User Needs to Know – Immediately! Hydroquinone works by inhibiting the enzyme tyrosinase, which is important for the development of skin melanin (pigment) . As long as you continue to use hydroquinone, you will inhibit tyrosinase, and hence pigment, production. Unfortunately, when you discontinue use of hydroquinone, your skin’s natural supply of tyrosinase will no longer be inhibited. Slowly but surely, your skin’s natural pigmentation will return. If you’re thinking that you should never stop using hydroquinone, consider this: in darker-skinned patients, continued hydroquinone-use has been associated with ochronosis, a darkening of the skin. It has been proposed that this occurs because hydroquinone inhibits an enzyme called homogentisic acid oxidase within the skin, which in turn causes the dark-colored homogentisic acid to build-up within the skin with prolonged use. Interestingly enough, this phenomenon has only been documented in darker-skinned patients. To be on the safe side, most dermatologists recommend using hydroquinone in four-month cycles, alternated in the off-months with milder tyrosinase inhibitors, such as azelaic acid, kojic acid, and arbutin. 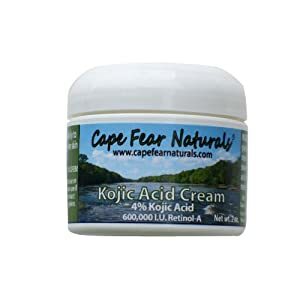 I personally recommend Cape Fear Naturals Kojic Acid Cream Skin Brightener ($11.95, Amazon.com) with 4% kojic acid, the highest concentration available in the U.S. market without a prescription. To be frank, the packaging could use a makeover and the retinol is rendered virtually worthless with full air exposure in the open-top jar container. But the truth of the matter is, no product on the market contains more skin-lightening kojic acid for a lower price. 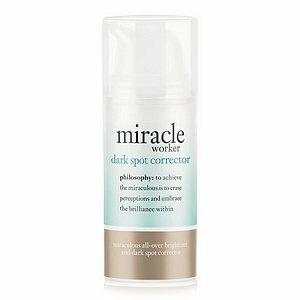 It also works well when alternated for four months with hydroquinone, as mentioned above. 2.) Do NOT use any other products containing benzoyl peroxide while you are using products containing hydroquinone. Use of hydroquinone with any products containing peroxides like hydrogen peroxide or benzoyl peroxide may cause a temporary staining of the skin (Drugs.com). This staining can typically be removed with soap and water, but it’s still best to avoid benzoyl peroxide-based acne treatments and oxygen-infusing skin care treatments (which typically contain hydrogen peroxide) while using hydroquinone. 3.) Do NOT use any products containing resorcinol while you are using products containing hydroquinone. Remember that skin darkening I was talking about earlier (ochronosis)? Unfortunately, ochronosis in persons with darker skin is a well-documented phenomenon for those who combine use of resorcinol and hydroquinone. Hundreds of ochronosis cases have been documented from using resorcinol/hydroquinone combination treatments in South Africa before 1984 (Journal of Dermatological Treatment). So I definitely would not recommend using hydroquinone with any of the new resorcinol skin lightening treatments, including Clarins Vital Light Serum and Philosophy Miracle Worker Dark Spot Corrector (shown above). While I love each of these products on their own, I would not recommend combining them with any treatments containing hydroquinone, even for those with lighter complexions. 4.) Do NOT get hydroquinone anywhere near your eyes. Despite popular belief that hydroquinone may cause cancer, hydroquinone’s most serious human health effect is pigmentation of the eye and permanent corneal damage (Journal of the European Academy of Dermatology and Venearology). While this only occurs when the eye is directly exposed to hydroquinone, it is still a risk factor. Therefore, it is vitally important to avoid the eye area when applying hydroquinone-containing creams. 5.) Hydroquinone has NOT been directly linked to cancer in humans — only mice. Instead of being harmful to the skin, hydroquinone increased the number of benign (non-cancerous) liver tumors, reducing the proportion of cancerous liver tumors in mice, thus suggesting that hydroquinone may exhibit protective effects. (For you science buffs out there, there was an increase in hepatic adenomas and a decrease in hepatocellular carcinomas). Some argue that hydroquinone is banned in the European Union, but I would also argue that hydroquinone is used ubiquitously in Japan, South Korea, and many other Asian countries — and the cancer rates are far lower in most Asian countries! Of course, correlation does not imply causation, and I am not implying that hydroquinone prevents cancer. However, I am suggesting that hydroquinone is likely not a cancer-causing agent, or cancer would be far more prevalent in Asian countries than in the ultra-cautious EU. Of the skin-lightening and age spot-brightening agents out there, 4% hydroquinone is the most effective. Overall, it is considered to be safe, but it is important not to use hydroquinone in conjunction with any creams containing peroxides or resorcinol, to avoid the eye area completely, and to alternate with other agents every four months so as to lower the risk of ochronosis (skin darkening from the build-up of homogentisic acid). In addition, if you have darker skin, you may wish to speak to your dermatologist before using a hydroquinone-containing treatment, as ochronosis is much more common in those with darker complexions. I hope this guide helps you. Please, keep the great questions coming!